That TORR near French Camp is heading in the general direction of Columbus, MS. I was just looking at Gary Schmitt's stream on Live Storm Chasing (he's currently near Okolona, MS), and it looked like he had a wall cloud visible on it. Is that’s Jackson’s DMA? Want to stream coverage. I hit up google and it’s actually Columbus MS. WCBI is streaming. Tupelo, MS, stations WTVA and WCBI are livestreaming right now. The provided links go directly to their respective livestreams. Not all that familiar with the region. Thank you! STP is maxed out over East MS and West AL. These storms are moving right into the best dynamics. Yeah, not sure why they went with the "brief" tornadoes wording when those storms have the best discrete supercell character of the day. 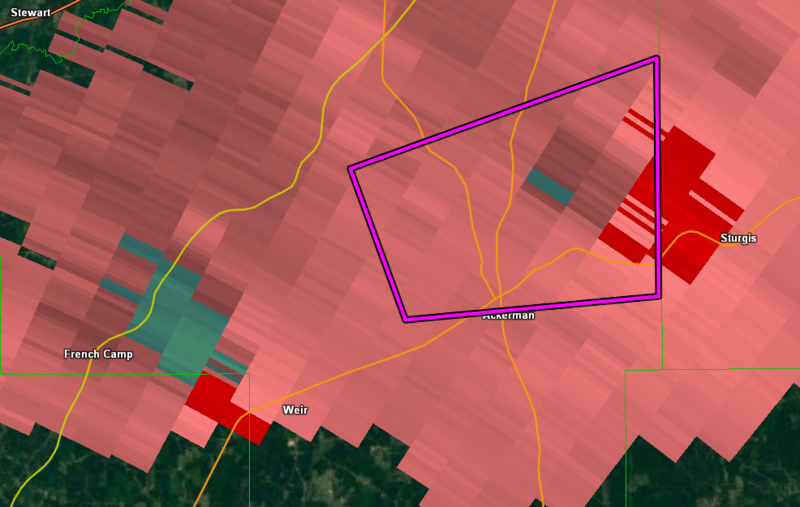 I'm not showing a warning for the rotation over French Camp. Is it warned? Looks like it should be. And those two are right movers too in East MS.
Northern cell's rotation about to go right over Smithville, like they need that again. It's got a SVR on it for now. Storm just NW of Ackerman is TOR warned now. TOR warned storm went right over Smithville but nothing dropped. The storm followed the path of the 4-27-2011 storm almost exact from Okolona on over. It may be getting its act together as it crosses into AL. RadarScope has been having server issues all day. Earlier there was no hi-res data. It’s slowly coming back. And now it has a TOR issued for it.